This Art Deco-style theatre hosts a variety of events at The Woodruff Arts Center. Parking: A variety of street and deck parking is available in the area. 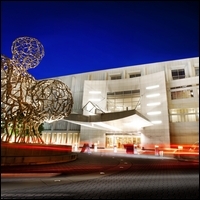 - The Woodruff Arts Center Parking Garage, located on Arts Center Way between 15th Street and 16th Street - Promenade Garage, located on 15th Street at the intersection of 15th Street and Arts Center Way - Colony Square, located at 14th Street and Peachtree Street - Midtown Plaza Parking Deck, located on Arts Center Way between 16th Street and West Peachtree Street MARTA: Take the Red or Gold Line to the Arts Center Station, and follow the signs to The Woodruff Arts Center.